You likely don't need any more tools, programs, or workshops to improve your hospital. What you need is a simple and consistent approach to manage problem-solving. Filling this need, this book presents a Lean management system that can help break down barriers between staff, directors, and administration and empower front-line staff to resolve their own problems. 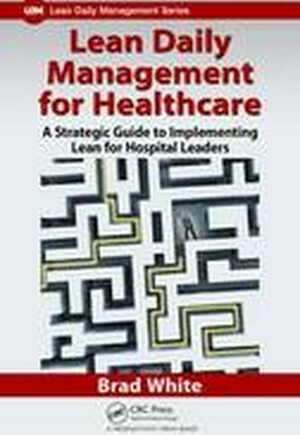 Lean Daily Management for Healthcare: A Strategic Guide to Implementing Lean for Hospital Leaders provides practical, step-by-step guidance on how to roll out Lean daily management in a hospital setting. Ideal for leaders that may feel lost in the transition process, the book supplies a roadmap to help you identify where your hospital currently is in its Lean process, where it's headed, and how your role will change as you evolve into a Lean leader. Illustrating the entire process of implementing Lean daily management, the book breaks down the cultural progression of units into discreet, objectively measurable phases. It identifies what leaders at all levels of the organization must do to progress units into the next phase of development. Complete with case studies from different service areas in the hospital, the book explains how to link problem-solving boards together to achieve meaningful and measurable improvements in: the emergency department, the operating room, discharge times, clinics, quality, and patient satisfaction. After reading this book you will understand how consistent rounding, a few whiteboards, pen-and-paper data, and a focused effort on working the Plan-Do-Study-Act cycle can help you build a common problem-solving bench strength throughout your organization-establishing the framework upon which future improvement can be built.